Springtime is the season of renewal, complete with fresh blooms on foliage, the buzz of pollinators and the flutter of butterfly wings. It’s also the time of year when animals are seeking the safety of your backyard to give birth and raise their young. It’s an excellent time of year to spend some time with your children outside, learning about the critters that share our environment. If you and the kids should happen to stumble upon some wildlife that looks like it might be in distress, there are some simple guidelines you can follow together to bring relief to the animal or to reunite it with its family. While your yard may be a safe haven most of the year, regular springtime maintenance can make it particularly dangerous to our furry and feathered friends. Here are some tips on how to keep backyard wildlife safe, and what to do if you should find a baby animal in distress. While you may get the urge to do some spring cleaning (in your yard), see if you can hold off until mid-summer. Spring and early summer are prime nesting seasons for many songbirds and squirrels. Your regularly scheduled tree trimming services are likely to disturb or destroy their nests or to orphan the babies. It is also very common for larger animals, such as raccoons or skunks to seek shelter in your attic, basement or crawl space to give birth to their young. Unfortunately, if pest removal services are not careful (and most are not), they may remove the adult without her young, leaving them orphaned. Opt for humane exclusion services and WAIT until the babies are old enough to survive without their mother. 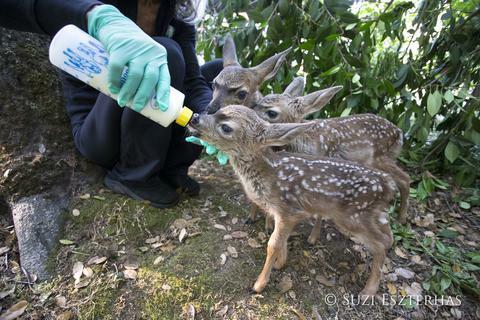 Fortunately, there are many amazing wildlife rescue organizations who are ready to help. Not only are they experienced with rehabilitating sick and injured animals, but they can also reintroduce them back into the wild when they are ready. How Do I Know If An Animal Needs Help? Just because you find a baby animal, it doesn’t mean that it is in distress. Every species is different. Some animals, like deer, leave their young alone for several hours at a time, while they look for food. Other wildlife babies are highly supervised. If you and the kids find a featherless (or mostly featherless) baby bird that has fallen from its nest, but appears unharmed, put it back in the nest, if you can reach it safely. Contrary to popular belief, birds will NOT abandon their young if a person has touched them. If the original nest has been destroyed or if you can’t locate it, please contact your local wildlife rehabilitation center. If you find a young bird hopping around with most of its feathers, that is good news! This little one is probably learning to fly and is most likely being supervised by its parents. It might be a good idea to keep your dog or cat at a safe distance, until the fledgeling is able to move itself to safety. Believe it or not, baby squirrels are a lot like baby birds. They can fall out of their nests or sometimes their entire nest falls out of a tree. If a baby squirrel appears to be uninjured, keep an eye on it and see if the mom comes back to claim it. If it’s a particularly cold day, put the squirrel into a shallow box on top of a warm water bottle wrapped in a dish towel. If mama doesn’t return by sunset, you should contact a wildlife center for advice. It’s hard to imagine finding a baby duck wandering around all alone, but it happens. A lot! Ducklings are mobile as soon as they hatch, but they still depend on their moms for warmth, guidance and protection. They often have to walk over a great distance to find water, sometimes causing them to cross busy streets, backyards, and storm drains. If you see a mama duck with her babies out on the town, step aside and let her do her job. 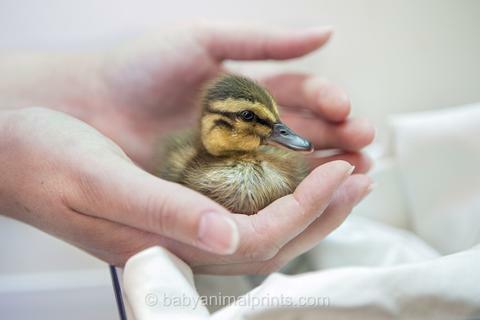 But if you find a single duckling all alone, it may need your help! Look around for the rest of the family. If you find them, bring the baby as close to them as you can. If not, you may need to bring it to your local rescue center. It can be confusing to find a fawn lying, partially hidden in your backyard. Is it okay? Did its mama abandon it? Be sure to reassure your children that the baby has been intentionally hidden by its mother while she goes to look for food. Unfortunately, deer can’t hire babysitters, so she finds a place that seems secure, leaves baby for awhile, and then returns to feed it. It’s best if you slowly back away, making sure to contain your pets, so that the baby can rest quietly until its mother returns. If you decide it’s necessary to bring the baby to the rehabilitation center, you will need to transport it safely. The last thing you need is a baby animal on the loose in your car! Prepare a cardboard box or an animal carrier with padding, such as paper towels, washcloths or old dish towels. Wearing gloves, carefully put the baby inside. Please do not give the animal any food or water to protect it from choking or drowning. Have you encountered any baby animals in your backyard? We’d love to hear your story, so please tell us about it in the comments below.